What causes a joint at the hand or wrist to dislocate? Joint dislocations of the hand and wrist are among the most common forms of upper extremity injury. Finger dislocations occur following blunt trauma to the tip of a digit resulting in hyperextension of one of the finger joints. When the mechanism is of low energy the result may be a mild ligament stretch or partial tear – commonly referred to as a Sprain. When a large portion of the supporting ligaments at a joint become disrupted a true dislocation may develop, implying that the bones meeting at the joint have moved out of normal alignment. 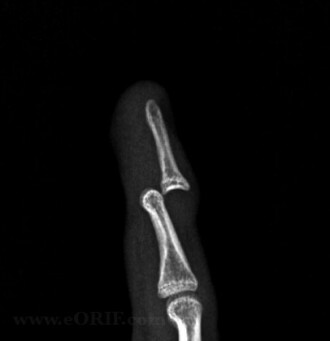 Often an accompanying small fracture may be found together with a dislocation. Wrist dislocations arise after a high energy injury to the upper extremity such as a a fall from a high place. Several forms of wrist dislocation may develop depending on the direction of force and energy delivered to the joint. How is a Dislocation at the hand or wrist diagnosed? A dislocated joint displays swelling and limited motion. Movement is painful. An X-ray is needed to confirm the diagnosis and determine if there is a fracture present. How is a Dislocation of the hand treated? Treatment for a dislocation depends on stability once the joint is placed back into alignment. In stable cases splinting may be sufficient, while more complex, unstable dislocations require surgical intervention. Wrist dislocation almost always require surgical treatment followed by prolonged casting. Once movement is allowed Hand Therapy is often required. To have your hand or wrist dislocation evaluated and treated by Dr. Steven Shoen at one of his two office locations ( Edison-Metuchen area or Monroe) call 732-632-6090.